My next destination was Istria, a peninsular on the northern Adriatic coast of Croatia that used to be a under the altering rule of the Romans, Franks, Venetians, Austrians, French and Italians until 1945 when it was finally handed to Croatia. The ambitions of the assorted conquerors are easy to understand once you see the Istrian seaside with clear blue waters and pebble-stone beaches and its interiors with hazy rolling wooden hills. Here they call it green and blue Istria: green Istria comes with its fertile lands producing olives, grapes and other fruits while its lush woods hide truffles and wild asparagus; the waters of blue Istria are good not only for swimming but also make a habitat for fish of all sorts, oysters or spider crabs. I came to Pula, the administrative center of Istria, in the early evening to find the ancient Roman town saturated with the heat and humidity.The Triumphal Arch of Sergius (27 BC) in the pre-sunset sun made for a luminescent dreamy scene as if setting up the stage for the movie festival held in the ancient amphitheater as the posters around the town were announcing. As I got off the bus I entered a scene from a movie featuring Provence or Tuscany with vintage-styled lighting, saturated yellow tones and a bit of haze. I was so taken aback by the feeling that I nearly slipped on a something that appeared to be a crashed fig. I looked up and saw a fig tree and I burst into a laugher - I adored the fact that something I could only buy in Zagreb was growing in such an abundance in this land. Then I saw gigantic purple burrs that looked like a multi-magnified version of the ones I saw at the Dovec market in Zagreb. But far more striking than all the visual impressions was the aroma of the place: the air was like a rich sauce where the smells of the sun-dried grass, warm green leaves, sweet plants and coniferous trees have been simmering in the thick salty humid sea air and getting stirred by the light breeze. It was Istria - green and blue coming together. That night I went to a highly recommended restaurant Kantina set up in an old cellar of a 19-century Austrian-Hungarian villa: the food and wine did not disappoint indeed but the major gastronomic revelation was delivered to me in a glass jar with my cheese platter and a selection of breads. I was served an outstanding extra virgin olive oil with a delicate taste of green olive and a glimpse of freshly cut grass and mild bitterness making for a youthfully bold and seducing flavor. I have asked the waiter about the oil and he said that it comes from a local producer who supplies the restaurants. This sounded like an beginning of an interesting quest. The Istrian tradition of olive oil making dates back to the ancient times when it was brought to the area by the old Greek and Phoenicians and during the Roman times the best olive oil was actually produced in Istria. The production was supervised by the emperor himself and all Roman emperors owned an olive-grove in Istria. Interestingly enough, Istria is the most northern region in Europe where olives grow: just a few steps up north and you won’t be able to find any olive tree any more. Istrian soil is very appropriate for olive cultivation and there are two major olive oil producing areas in Istria - down south around Vodnjan and up north-west around Motovun and Umag. Most of the land in the inner Istria was abandoned by the Italians who left after the Second World War and then by the many Yugoslavs who left their country to avoid oppression and poverty. Only in the last 10-15 years Istria saw people coming back to live here and cultivate the land. Many olive groves were destroyed during the times of Mussolini who was keen on growing corns instead (sounds familiar as Khruschev was also keen on cultivating corn crops in the USSR). Yet the people who have came back are now growing the olive crops with their own efforts and some government support and taking particular care to cultivate the indigenous sorts of Istria such as bjelica, karbonera, buža and žižolera. No wonder that the olive trees in Istria have survived the wars, conquests and eccentric politicians: with the exception of low temperatures olive trees can tolerate pretty much any conditions: in fact the oldest tree in Istria aged at nearly 1700 years old is found on the Brioni Island near the Istrian peninsular and even today it bears fruit. It is time for the first-hand experience of the beautiful olive oil produced in the region and with the help of Ozren, guru of Istrian gastronomy and tourism professional, we visit the showroom of Meloto brand produced by the Belci brothers. Matteo Belci narrates the story of his father and uncle who have started the olive oil production. Nowadays the family has 8 ha of the olive groves and produces about 1,800 kg extra virgin olive oil per year specializing on the indigenous sorts of the olives. Matteo gets to the explanation of the production process. 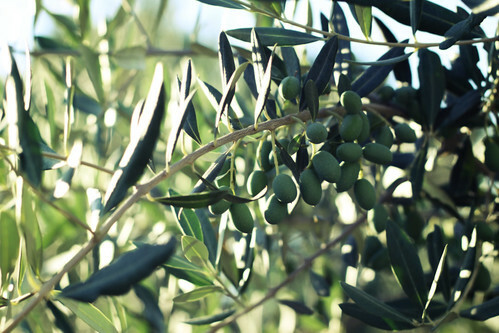 First, the olives are hand-picked using a wooden ladder called shkalun that is leaned against the tree. Apparently, the skin of olives tends to absorb the substances it interacts with and if machines are used to first shake the trees and then gather the olives from the ground the olive oil gets pungent taste as the olives have absorbed substances from the soil. When hand-picking olives for the Meloto oils the family sticks to the ratio of three fourths of the green olives and one forth of the black olives: while larger share of the black olives increases the oil yield it is also detrimental to the taste as the black olives have started fermenting. Briefly after picking the olives go through the cold pressing: lead time in the olive oil production is very short - if the olives were picked in the morning you will have a a bottle of the freshly made olive oil by the lunchtime. Generally, the younger the oil the better: unlike with wines olive oil does not improve with age and it will never be better than it is in the year of its production. Matteo explains that good olive oil has to be carefully chosen to accompany food and there is a science here akin to wine pairing: for example, fresher lighter oils will go best with fish while more pungent ones should be selected for meat dishes. I have asked if the family of Matteo produces coupage, or mixture of different sorts of olive. Matteo replies that mixing different sorts of oil is a job of a chef who is striving to obtain particular taste while the job of the oil producer is to let the taste of each specific sort to pop up and come out at its best and purest. The comparison of olive oil with wine is not random: there is a whole industry behind olive oil standards, professional tasters and competitions. Two key qualities that the olive oil gets assessed on are taste and smell. 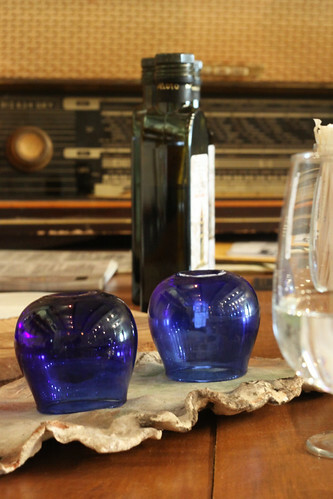 Interestingly enough, the color of the olive oil tells nothing about its quality and the professional olive oil tasting is done with blue glasses so that the color of the oil does not influence the opinion of judges. Professionals assess key seven characteristics of the olive oil taste: sweetness, olive taste, grass, apple, fruit aroma (fruitiness), amount of bitterness, and intensity of the oil’s pungency. A spider-net chart is then drawn for each oil to reflect its grades on the various characteristics: the charts for better oils look more rounded indicating the balance of all the key features. So, we start the tasting. Matteo is pouring out a small quantity (about 1 tbsp) of the first oil into the cups. Each of us takes the cup in one hand and covers with the other while swirling the oil a bit - the oils needs to get some heating for the aroma to release. After a minute or so we uncover the glasses and inhale the aroma. Here comes the pleasant fresh green aroma of buža olives. Then we take a small sip from the cup: you should do it with some slurping to enrich the oil with air that helps spread the oil throughout your mouth. Now rest your mouth for a second and gently rob your tongue against the palate. After that inhale some air through the half-closed lips still not swallowing the oil and repeat the trick a few times. Eventually we swallow the oil and I note down its delicate taste of green olive with the glimpse of freshly cut grass and green apple. Then peppery sensations come from the back of my throat - this is what professionals call as "pungent taste". Eventually the flavor comes back to my upper throat with nice bitterness. What an oil! We wash our mouths with water, you can also have a bite of apple which is also good for palate cleansing during the olive oil tasting. I recommend this tasting exercise to anyone: try a regular version of a supermarket extra virgin olive oil and my bet is you will soon be looking for a specialty shop nearby to replace the product you have been using. At least in my case this tasting session has brought my standards of good extra virgin olive oil to the heights that will be definitely pleasing my tastebuds and hitting my wallet. I do envy Istrians as good extra virgin olive oil is among the staple foods in the region: you will get it served with freshly baked bread, cheese platter, fresh vegetable salads, over grilled or sautéed vegetables, ice-cream and what not! The question is whether there is a situation where extra virgin olive oil will not be appropriate. Well, I have learned that actually extra virgin oil oil is not good for cooking as if you hit extra virgin olive oil above 350 °F (177 °C), the unrefined particles within the oil get burned which leads to deteriorated taste and possible toxicity. In all the other cases you can hardly spoil a dish by adding some high-quality extra virgin olive oil. Here is one of those cases: let me share the recipe of a mind-blowing breakfast dish traditionally eaten by the Istrian farmers that Matteo has prepared for us after the tasting. This uber-simple recipe calls for the highest quality ingredients and provides a balanced nutritious start-of-the-day meal that has once kept the Istrian farmers fit for their day fieldwork. Even if you don't work in a field - a merry and productive day is guaranteed! Boil the egg for 1 minute. Peel the egg and release into a whiskey glass. Add the extra virgin olive oil and mix with the egg: no need to whisk it, the substance will not get homogeneous and there is no need for it to - hey, it is simple farmer's food. Add salt. 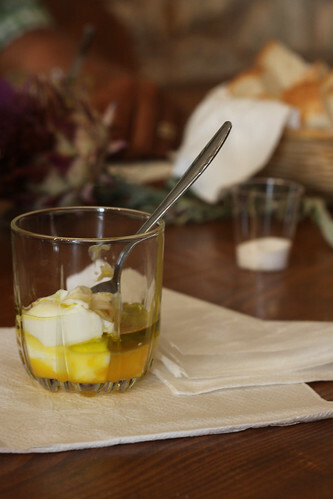 Enjoy by dipping the pieces of bread into the egg and oil mix. The fun part comes ones you finish the dish but there will be something left on the sides of the glass: pour in some red wine, swirl the glass, wash down your breakfast and have a glorious day ahead!